(On Board PR Flight 113) -- I’m okay, my eyes are okay. May konting injury lang. Thus declared Filipino World Boxing Association welterweight champion Manny Pacquiao Tuesday as he allayed fears that he had suffered career threatening injury to his left eye in an aftermath of his 12-round lopsided title victory over challenger Adrien Broner on Saturday at the MGM Grand Arena. “Minor lang naman ang injury. Sabi ng doctor na-scratch lang,” Pacquiao told this writer in a telephone interview before the latter took his Philippine Airlines flight bound for Manila. 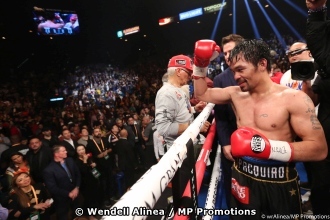 Pacquiao, according to his doctor, as reported by his Senate information officer Aquiles Zonio, suffered a scratched cornea in his left eye during his one-sided win over American title pretender on Saturday night (Sunday in Manila) at the MGM Grand in Las Vegas. ”In fact, nakapanood na ako ng NBA game kagabi between Golden State Warriors and Los Angeles Lakers sa Staple Center,” he said. Pacquiao, it was earlier reported, was complaining of a slight pain and partially impaired vision involving his left eye after the fight. He allayed earlier reports that he may have sustained a detached retina, a serious eye injury in which the retina becomes separated from the eyeball, that may cause loss of vision. The now 40-year-old Philippine senator, likewise, denied the injury was caused by a punch from Broner. Pacquiao came to the post-fight press conference wearing dark glasses but never mentioned the injury. When Pacquiao and his team returned home Sunday evening in Los Angeles on Sunday, it was discovered it had been burglarized. Pacquiao and wife Jinkee, chief trainer Buboy Fernandez his training team and several office staff fly back to Manila Wednesday (Thursday in Manila).